One hot summer’s day, a small tortoiseshell Manx cat appears on my doorstep. She looks hungry and frightened with no place to go. Where has she come from? Where is her home? After a meal and some kindness, it’s easy to see that the little, lonely cat is eager to stay. But is she lost? Is anyone looking for her? A search turns up nothing; has this little cat been abandoned? Perhaps she will find her way home in the evening. As day turns to night, the clouds get quite gloomy, and soon, the little cat returns. Clearly, she is in need of a loving home, family and a new name. How about Lulu Kitty? Safely inside, she shakes off the chill and sets out to explore. Night settles in, and our sweet Lulu Kitty snuggles up in her new favorite spot at the foot of the bed. This little cat has found her forever home where she sleeps that night and all the nights thereafter. ​Sadly, stories of pets who are neglected and abandoned are common, and many don’t have happy endings. The responsibilities of having a pet are considerable, but the benefits of kindness and the joy that comes with four-legged family members are much greater. 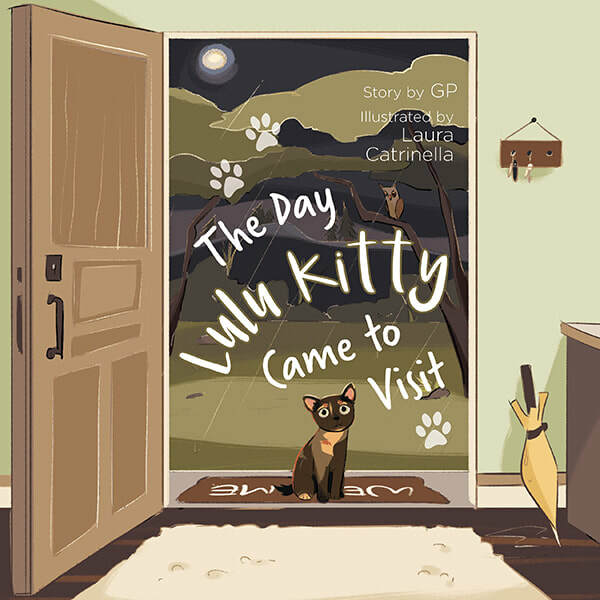 The Day Lulu Kitty Came To Visit is a story of compassion, trust, and the lasting bond that develops between a pet and its owner. ​The Day Lulu Kitty Came to Visit is the first in the Three Cat Night - Book Series. Look for the next book in the series: A Cat Without A Tail, starring Loki, a blue lynx point Manx.